This article is about Massachusetts state flower, "the Mayflower", for an article about the Pilgrim's ship, please see: Mayflower. The Mayflower, (Epigaea repens L.)  also known as the "trailing arbutus", is Massachusetts state flower. It is a perennial shrub of the heath family, with evergreen leaves and small, pale pink or white flowers. The plant grows close to the ground, prefers acidic, sandy soils and grows best in partially shady areas along rock ledges, steep banks, and under or around evergreens. It blooms in the early spring and summer, grows only a few inches in height, has small, 5 lobed flowers of about 1/2 inch each and can survive in low moisture conditions. Massachusetts adopted the mayflower as the official flower in 1918. It was also named the provincial flower of Nova Scotia by an Act of the Legislature, in 1901. 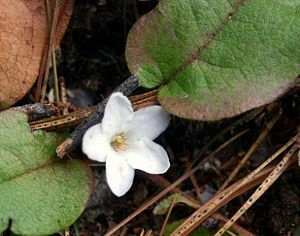 Trailing arbutus grows wild in several states in the U.S. and in parts of Canada. This page was last modified on 9 April 2019, at 12:20.